Santa's Coming to Town and We Know Where! Santa&apos;s Coming to Town and We Know Where! Here&apos;s Santa&apos;s itinerary as of today! We expect more Stillwater visits from the jolly ol&apos; man to be shared and announced and we&apos;ll update Santa sightings as we learn of his whereabouts. Thursday, Dec. 1 from 5 - 7pm at Sears Hometown Store at 1001 S. Main St.
Sunday, Dec. 4 from 1-3pm at Oklahoma Harvest Market at 1020 S. Main St.
Thursday, Dec. 8 from 5-7pm at Kindermusik at 112 E. 8th St.
Saturday, Dec. 17 from 1-3pm at Stilly Arts at 1207 S. Main St.
Thursday, Dec. 22 from 5-7pm at Furniture Showcase at 424 S. Main St.
He&apos;s making at least a couple more special stops and with all of the good boys and girls in Stillwater, we expect he will make even more. We&apos;ll keep you posted on his location and ETA this season! 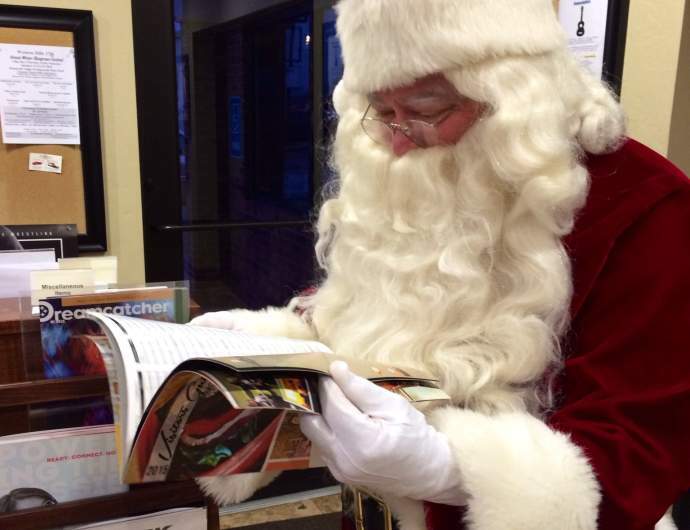 Santa will be visiting the Stillwater Armory on Tuesday, December 6th from 4-7pm. Milk and cookies will be served and little ones will be able to fill out their Christmas wish lists as well. The Stillwater Armory will be taking cash donations in support of Kickin&apos; Childhood Hunger. Santa&apos;s making a stop at Lake McMurtry on Saturday, December 10th from 6-8 pm. Take a picture with Santa then enjoy a hayride through the festively decorated park. Enjoy hot cocoa, cookies, crafts, Christmas stories and carolers. Bundle up and head over to the East Side Recreation area December 10th! Monday, December 12th from 5-6:30pm, Santa will be at The Piano Room inside The Atherton Hotel for milk and cookies!